Opening times Mon–Fri noon–2.30pm & 5.30–11pm. Food served Tue–Sun 12:30–2:30pm, 5:30–11pm. Closed Mon. 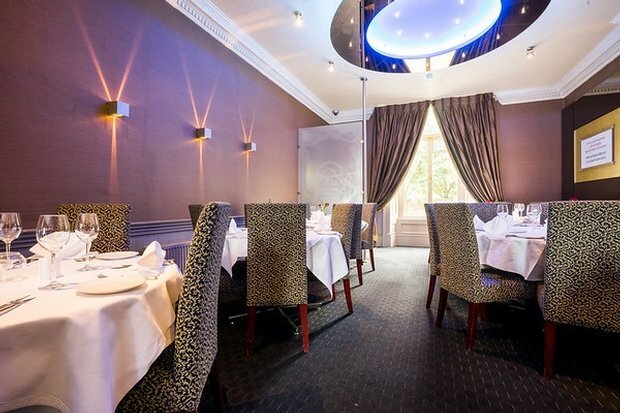 Elegant Indian restaurant within a grand converted townhouse in Edinburgh's West End. Located in a plush renovated townhouse in Edinburgh’s West End, this elegant Indian restaurant impresses from start to finish. The menu fuses the very best Scottish produce with Indian flavours, including North Sea monkfish grilled in the tandoor, hake smoked in-house and served with tamarind spiced courgettes, and the restaurant's most popular dish - venison boti kebab. The nine-course tasting menu is highly recommended if you fancy a blowout – dishes include Shetland scallops and mussels dressed in an aromatic coconut and curry leaf sauce, grilled tawa lobster and succulent seekh kebab. A sommelier is on-hand to guide diners through the extensive wine list, while a dedicated patisserie chef crafts exquisite desserts to round off the meal, such as saffron poached pears served with cinnamon ice cream, and star anise and Callebout hot chocolate mousse. Mumbai Diner’s Club is already well on its way to establishing itself as one of the city’s top restaurants for fine Indian dining.